"Attention, this is a real emergency. A dam has just broken, evacuate immediately from your homes, follow the exit route to a safe place and wait for further instructions." The whole place went into panic mode as tourists and residents got into their cars and clogged the town's narrow streets. Some left all of their belongings behind. Just two weeks earlier, in neighbouring Brumadinho, an earth embankment tailings dam operated by Brazilian mining giant Vale had broken, killing 308 people. It was the worst industrial disaster in Brazil's history. But it was a false alarm. Vale had detected a problem in the dams and decided to sound the alert, but the dams hadn't actually been breached. I visited Macacos just after Carnival week, which is usually the busiest time of the year. Most residents in lower-lying areas have had to abandon their homes. Among the few still left are business owners. But they don't know whether to wait for things to change or restart their lives and businesses elsewhere. "Our economy is over, business owners will not be able to make a living any more. All the peace and quiet we had of waking up in a safe place, is gone," Geruza França, who owns Café Judith, tells me. "My café was my dream. I don't know what will happen to it now. I keep thinking: did I lose my entire dream overnight? It's like someone came and snatched it all away." Leonardo Batista, who runs the Pousada Kumaru hostel, argues that most of the district is on higher ground and would not be affected by any dam break, but he doesn't know whether businesses will be able to convince the tourists to come back. Macacos is one of dozens of districts and towns in Brazil's Minas Gerais state that are feeling the effects of the Brumadinho tragedy. Vale and other firms, alongside local authorities, are working to eliminate the risks of further tragedies by decommissioning 50 tailings dams - draining the water from them. "We don't want Vale to stop mining here but we don't want to be the ones to pay for their problems," says mayor of Itabirito, Alex Salvador. Image caption Alex Salvador: "We don't want Vale to stop mining here but we don't want to pay for their problems." On top of that there are safety concerns. Should the two dams near Itabirito break, the town would be hit within a few hours. Just a few days after Brumadinho, the town's authorities came up with an evacuation plan. The problems of Minas Gerais and Vale are not just affecting local economies. Global iron ore prices have soared since January, as Vale is the world's number one producer - and Minas Gerais state accounts for 45% of its iron ore output. Immediately after the disaster it saw some $19bn wiped off its share value. But as no other firm has the capability to take over Vale's market share, the iron ore price rise is now working to its advantage. Earlier this month Vale's chief executive Fabio Schvartsman stepped down after a disastrous appearance in Congress where he told MPs that "Vale is a Brazilian jewel" and "should not be condemned" for what he described as "an accident". Vale executives declined a BBC request for an interview. In a statement the company said it is "100% focused on supporting those affected and responding to the dam break". 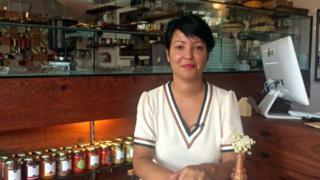 Geruza França is now thinking about closing down her café. What she can't understand is how such a powerful company caused so much destruction in so many people's lives. "How can these executives behave like this? I don't think they are made of flesh and blood. I think they are made of iron ore."